"Over the past two years, I have introduced several friends to Sculpt and even brought my mom to a class! The strength I have gained from Sculpt has also given me the confidence to try other fitness classes, but Sculpt will always be my favorite! I couldn’t imagine my life without it!" "I really enjoy standing-inner-thigh because it feels somewhat like a stretch, but I get the shakes every time I do it, so I know it’s working. I also love plank-to-pike mainly because it was nearly impossible to do when I first started at Sculpt, and it feels so good now." A few weeks ago we were fortunate to host the lovely women of the Wharton Fit Club! 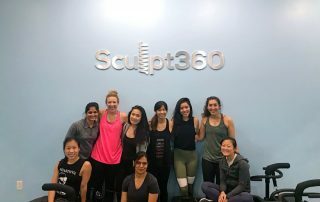 Isabelle Pan, one of our amazing instructors, is finishing up at Wharton and what better way to relieve all that school stress than a muscle-shaking Sculpt360 workout. 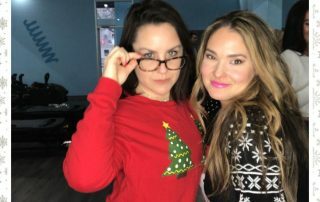 Thank you to all our awesome clients that joined us for our first Sculpt holiday party! Shout out to all our vendors CliqueCam for our selfie booth - see some of the photos below, Fuel for healthy eats, Guardian Nutrition for samplings of their awesome protein bars and powders. We need to let you know that Sculpt is probably the hardest workout you'll ever do. Our workout was designed to give you serious REAL results in just a 50 minute workout therefore the intensity is high. We pride ourselves on being the best value in Philadelphia. Our unlimited is a (much) lower price point than studios with a similar method (some don't even offer an unlimited). Why? Because we want you to join our community 3x per week and we know you'll take classes at other studios as well.